A desired candidate must have command in InVision, Photoshop, Illustrator, Coreldraw. They also need to have good organization skills as well can schedule their work as per the company's requirement. The experience required for the job is 4-8 years. SynapseIndia came into existence 15+ years ago under the guidance of Shamit Khemka. The company is an ISO 9001: 2015 certified organization and focuses on delivering innovative and quality services for clients globally. 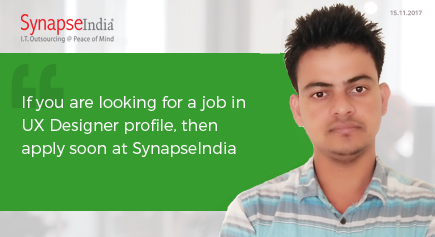 If you too have the desired skills and are willing to be a part of challenging and growing environment, then you can send us your updated resume at jobs@synapseindia.com and our concerned team will get in touch with you with further details.